The Mad Hatter was a bit of an oddball, but who wasn't a little bit crazy in the world of Wonderland? We just always thought he was the most fun out of all the madness running rampant in that world. Some of those guys were even a little too scary for us. The Tweedle brothers just talked about stories where oysters end up eaten, and the queen was always trying to cut people's heads off. If you ask us, we'll just stay at the tea party. The Mad Hatter on the other hand is more of a goofy, fun-loving individual who really knows how to pour a cup of tea. We're Americans so don't quite know if that's true, but we're catching up with Britain (that is if you count iced tea). Now the book always describes the crazy clothier as a man, but who says this iconic character can't be a girl? They can be just as silly, and celebrate those un-birthdays just as merrily as any of the guys can. Besides, Alice could use another female companion who's not trying to remove her head from her shoulders. Those hats he makes are super cute anyway. Not to mention all the colors he wears will translate into an absolutely wonderful dress! 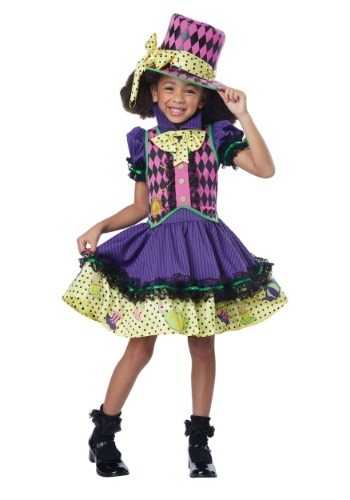 This one dominated by purple with yellow, pink, and green as well is a perfect dress up outfit for your little one. She'll be ready to ask everyone why, "a raven is like a writing desk," in no time. Do you know the answer? Neither does anybody else!